The inevitable cliche of make-up running out all at once typically happened to me during the weeks running up to Christmas. Being a time when I tend to wear more make-up (heavy foundation in the summer is a no-go), I had no choice but to invest in some more. However, this time, I wanted to try out some brands and products that I'd not tried before or used for a while rather than being stuck in the same old routine. Max Factor is a brand that I never usually buy as it is at the higher end budget of the high street brands but I've found not particularly much better. However, this foundation caught my eye - mainly it's gorgeous packaging - so I took a leap of faith and picked it up in the shade Warm Almond. So far so good, I really like the amount of coverage it gives which means you don't have to apply a lot. It lasts well and is really easy to apply. I have been using the Real Techniques Foundation Brush which came as part of the Core Collection set. It is smaller than some of the other foundation brushes I've used in the past so it takes a little longer to cover your entire face, but gives a really flawless finish and good for topping up. I'm constantly on the lookout for a nail varnish that is wintery but not your typical dark red/purple that is the fail-safe colour of the season. I found the shade Black Cherry on the Barry M counter in Superdrug and - admittedly it is a dark purple but it has a browny-black tone to it that is much darker than the standard shade. I have had a Chanel polish in the past that was really similar to this and the Barry M one is arguably just as long-lasting. Trying to deviate from the classic-Christmas-red is equally as difficult this time of year, but MAC have lucked out with their shade 'Mocha'. This one is actually my sisters but I am so smitten with this colour that no doubt I will soon be buying it too. It is an off-red browny colour that is striking but subtle enough to wear in the day. 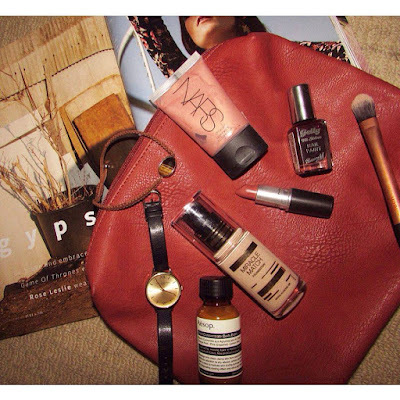 Nars is a brand that I have only started to use this year as I could categorically not afford it as a student. I have tried and fallen for their Sheer Glow foundation and equally as brilliant bronzer (in Laguna), so I was quite assured that I wouldn't be disappointed in the illuminator. I couldn't really decide between the shades but I've heard a lot about this one. The colour is darker than I'd expected but blends in really easily and gives a really subtle sheen to your skin. The Aesop Body Balm is another premium product that I can't get enough of. It is so moisturing and the citrus scent is amazing.